So last night we were hanging out in the kitchen, and I was telling Noah all about the cool Internet things I’m learning about. And he says, with a surprising degree of nonchalance, “Back when I used to make Star Wars web pages…” Um, what? Let’s back that train up and unload it. First, he used to make web pages? Second, STAR WARS web pages? Don't get too excited; it's not like George Lucas invites us to his ranch. The sites were unofficial (he couldn't take it further, what with being in middle school). Noah has a weird inability — and by weird inability I mean truly disturbing incapacity — to recall childhood memories at will, which means our marriage has been kept interesting by the random disclosure of things like the Star Wars Web Page Incident. This much I do know: The middle school era is an endless source of intriguing factoids from Noah’s past. He was a popular guy back then, because he was a good drawer and a fast runner. He always had a girlfriend. AND he was almost class president, but lost to a girl who clinched the African American vote. He still can’t speak of it without bitterness. The downside to having a trophy husband, like mine, is worrying about him being pursued by the lady folk. Especially when your trophy husband is in uniform. 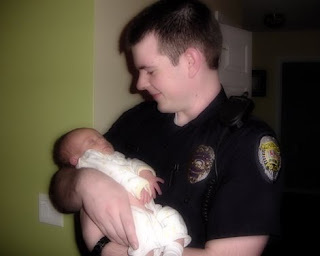 And does things like hold babies while in uniform. I don’t know if you’ve heard, but there’s a vicious rumor going around that a lot of cops have affairs, which has been perpetuated by a lot of cops who have affairs. Don’t get me wrong, I trust Noah 110%. And not just because I've threatened a swift, hard kick to the nads if he ever cheated — and that's just for starters. But I can't follow him around all the time, assaulting women who try to get out of tickets by flirting. Because I’ve been told they’ll have to place me under arrest if I do that again.